The Guna are one of the 7 indigenous nationalities that live in Panama. They live in three autonomous districts, of which two are located in the middle of the eastern side of the country. The third and most populated district is located in north-east Panama and stretches across the northern coast line from the province of Colón to the borders with Colombia. This is the district - or comarca - of Guna Yala, a community of around 33.000 Guna who inhabit the continental shores and the archipelago of San Blas. The archipelago is a tropical paradise immersed in the crystal-clear waters of the Caribbean Sea and it counts as many as 365 islands, of which 36 are inhabited. Guna Yala is a peaceful community where agriculture, fishing and tourism coexist. Everyday, small planes land on its shore to get lobsters, crabs, octopus and other fresh catch that will be sold to the best restaurants of Panama City. Away from the crowds of tourists that sail towards the uninhabited islands of the archipelago, the island where the Guna live are being impacted by serious issues that are undermining their way of living. Sunrise over the inhabited islands of Guna Yala. A rudimental barrier made with a mix of rocks, dead corals, sand and trash. The Guna have been witnessing the increase in the sea level and have been trying to contrast the phenomenon with the resources at their disposal, with catastrophic effects. In an attempt to expand the island and at the same time to block the water, they have started long ago to dig into the rocks and coral reef in shallow waters and alongside the coast. With a mix of rocks, dead corals, sand and trash, they are trying to claim land from the sea and to create rudimental barriers. It is estimated that in the last 20 years nearly 80% of the coral reef around the inhabited islands of the archipelago has been destroyed in order to build dams and protect parts of the islands from the sea. A futile effort that on one side has not stopped the strong tide from destroying the barriers, and that on the other hand harms the coral reef and the ecosystem. If anything, its destruction may have contributed to make things worse. Coral reefs is a key player in halting wave action, so when the coral is removed so is a natural protection. This has created chaos for people. “In the 70’s and 80’s inundations were also happening but not quite as strong,” says Pablo. The area surrounding Gardi Sugdub shows the signs of intensive destruction, and this means that the islanders are now particularly vulnerable to storms, rain and wind. A view of Gardi Sugdub from above shows the dramatic empty areas on the southern side of the island caused by digging in the coral reef. The equation is indisputable: the population increases on a territory - the island - that is disappearing and that provides few or no resources. Amalita Moralez and Sipu Hurtado, posing in the traditional Guna clothing. 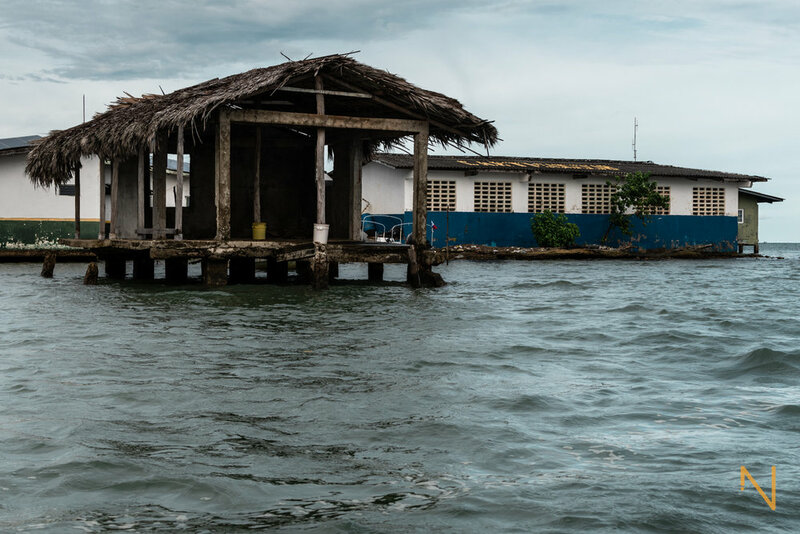 Under these circumstances the community of Gardi Sugdub and the neighbour community in the island of Gardi Muladub are waiting with mixed feelings to become the first ever indigenous group in Latin America to be relocated due to Climate Change. “Here in Gardi there are a lot of different opinions on our relocation onshore” - continues Pablo - “but the majority of us, around 75%, sees it as an opportunity. Older people like me want to stay. Here is where I was born and grew up, I am used to live here on the sea.” More than 1.500 Guna are going to leave their traditional cabañas built with cane sticks and palm leaves, and settle in the new village of Llano Gardi. The area is supposed to host around 300 houses of 41 square meters each, a bigger school and spaces for reunions and assemblies of the community. The inhabitants of Gardi Sugdub are taking part in what could be a pilot project for other communities to follow: "This project is going to be a model for the rest of the Guna” - says Blas Lopez, sociologist and community activist from Gardi Sugdub - "but some of the communities in the other islands don't think it will happen. There is a strong debate among the other 35 island communities. They see lack of support from the government, so they're waiting to see if Gardi will make it happen.” Blas is sure that all the other communities will move back to the mainland, if they succeed first. This project is supposed to be expense-free for the Guna, as the Panamanian government budgeted around 10 million dollars for all the infrastructures to be built. The project, that was started in 2010 and stopped many times due to mismanagement, corruption and bureaucracy, has started again in 2017 but up to this day there is no certain date yet as to when the relocation should start. The development plan of Llano Gardi will construct better and bigger schools and facilities for the education of children. The skepticism towards the construction of Llano Gardi clashes with the expectations of some of the Guna, for whom this project would actually represent a return to the origins rather than a new adventure. Historically they came from the continental regions of Urabá, Antioquia and Caldas in Colombia, where some communities still live, and then moved to the inner regions of eastern Panama. Assemblies of Guna have been discussing about the relocation plan to the continent with great interest in the past year. This is one of the challenges that is awaiting the Guna living in Gardi Sugdub. They are self-managing the whole relocation process with their own committee, trying to push the institutions to act faster. The Southern shore of Gardí Sugdub. In the background, the outer border of the school cannot be protected anymore by the fury of the sea. If Climate Change was not a thing, the problem of an overcrowded island would be solved by moving some of the people to other islands. When all of them are affected by flooding and loss of land, there might be no other options left than to move to the continent. Ngäbe - Update along the Journey!